The roadway network covers about 75,000 km., 7,955 of which are paved. The main axis links the capital with the interior (East to West). At the same time there are a series of branches that connect the main roadways and allow communication with neighboring countries, specifically with Namibia, the Democratic Republic of Congo and the Republic of Congo. Small and medium sized enterprises could be established to build and run hotels, inns, motels, car rental agencies, foreign exchange agencies, restaurants, tour vehicles, as well as in other sectors of the Economy such as distribution of gas and linked services, health care units, commercial activity in general, etc. 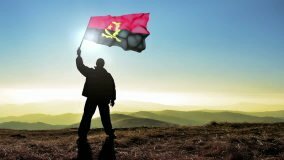 This is Angola’s most important foreign trade route. The maritime infrastructure in general is in acceptable condition, and this has allowed Angola to meet the very heavy traffic needs. Mostly aimed at passenger traffic, both international and national. There is a network of airports and airfields distributed over the whole country that allows immediate access to every point in the national territory as well as to other countries from the 4 de Fevereiro International Airport in the capital Luanda which has some of the heaviest air traffic in the whole of Africa. The national airline is TAAG and has routes to Africa, Europe and South America. Another major international operator is TAP (Air Portugal) with several flights a week and British Airways from the UK. There are many inter-provincial operators such as Sonair and SAL, offering charter flights either in heavy or light comfortable aircrafts. Helicopter hiring such as Sonangol are also in offer as well. Emirates Airlines .. Dubai, U.A.E. There is a fluvial network made up of large rivers with several falls, rapids, and lakes, some of which are navigable over dozens of kilometers and also appropriate for bathing and water sports. Some of those rivers are the Kwanza, Zaire, Kuando and Cunene. Angolan rivers offer excellent opportunities for transportation both for Tourism or a mix of Trade and Tourism.